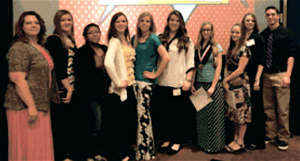 (l-r): Jeanne Crookston, Madison Purvis, Larecia Lopez, Mariah Mudrow, Saige Judd, Jaicee Busener, Kaytlyn Grover, Alyssa Cluff, Melonie Mudrow, Zac Waite. Courtesy image. The students competed in five different events – impromptu speaking, public speaking, job interview skills, children’s literature, and exploring educational careers. 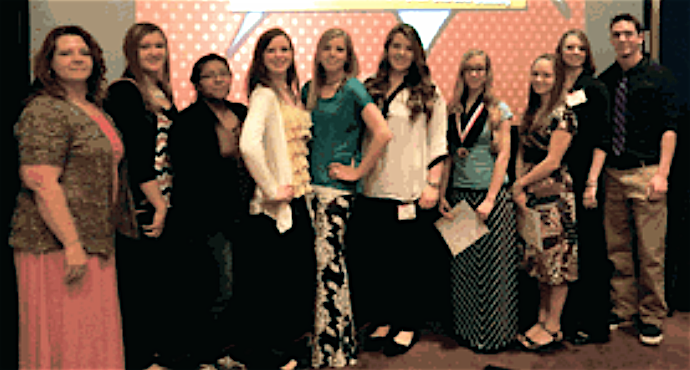 It was the first time for these students to compete at the state level. “It was exciting and scary, but I am really glad I went this year,” said Jaicee Busener, an FEA student. Mariah Mudrow and Saige Judd took fourth place with their Original Children’s Story, and Kaytlyn Grover took second place in Job Interview Skills. “Our hard work really paid off. It doesn’t matter that our school was the smallest school competing. We did our best and it showed!” said Mariah Mudrow. “I am really proud of the way these students represented Fredonia High School. They were professional and well-prepared. They all worked exceptionally hard and it paid off,” said advisor Jeanne Crookston. Fredonia FEA would like to thank all of the people and local businesses that helped sponsor them in going to the state competition. It wouldn’t have been possible without them.